October 3rd, 2014 is Manufacturing Day, an event in which manufacturers across the country will be opening their doors to show students, job seekers and the general public the potential to be found in a manufacturing career. A couple of weeks ago we took a look at some of the most unusual jobs in welding to commemorate the upcoming event. 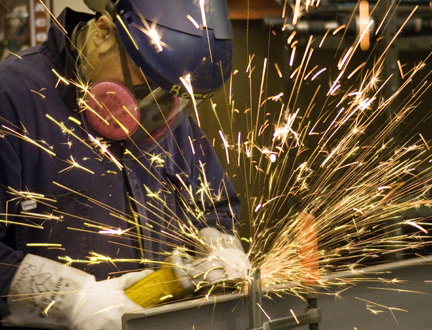 This week we look at some of the most exciting jobs welding has to offer. A NASA welder grinds welds on an Ares I-X rocket segment. Ares I is part of the next generation of launch vehicles that will take humans back to the moon and on to Mars. NASA – At some point in every kid’s life, there’s at least one moment when they dream about what it would be like to be an astronaut. Unfortunately, only a few people ever get the chance to be hurled into space, but welders can still be involved in space travel by working with NASA. Workers at NASA are responsible for building and maintaining the light, fast and durable vehicles needed for space exploration. It’s not an easy job to get, the job pool at NASA is still limited, but at least you won’t have to pass a g-force test. 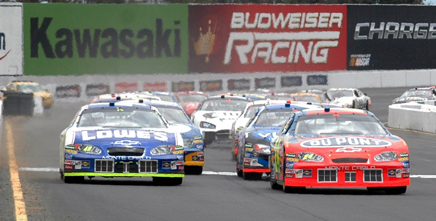 Sprint Cup Series race cars at Sonoma Raceway in June of 2005. NASCAR – Speaking of light, fast and durable vehicles, motorsports are a terrific place for welders who can work fast without sacrificing attention to detail. The frenzied high speed, intense- energy environment of a motorsport crew is a perfect place for a skilled welder to ply their significant skills. In NASCAR, about 950-man hours are spent on welding and fabricating each car before the vehicle ever hits the road. Robotic welding on an auto assembly line. 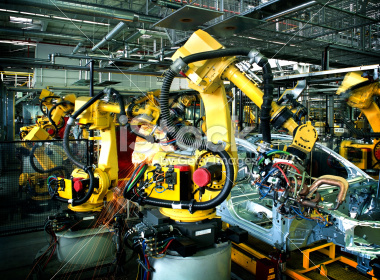 Robotics – We wrote about robotics a few weeks back, debunking many of the myths and fears that robotics inspires about job security in manufacturing. However, robots don’t just fill job gaps, they also generate new work for human welders. After all, robots are made out of sturdy metal, and in addition to needing welders for robot construction, welders are also needed to operate and maintain robots. A Navy diver welds a repair patch on the submerged bow of an amphibious transport dock. Underwater Welding – In order to become an underwater welder, you must also become a certified diver. Although this makes underwater welding a very specialized field, it also makes it one of the more unusual and exciting career paths available. 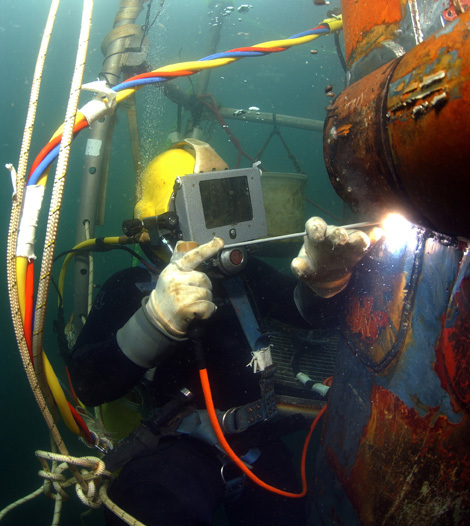 Few types of welding can claim a truly unique work environment as honestly as underwater welding. 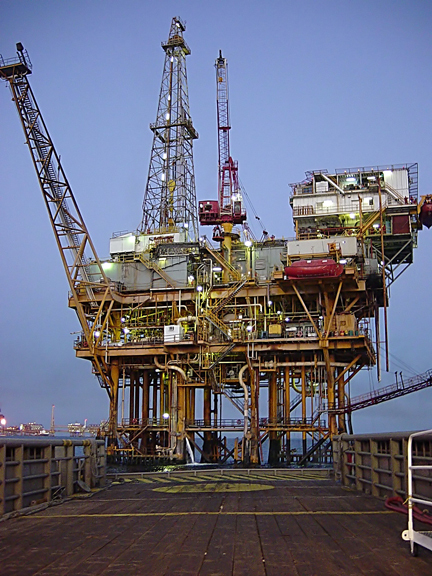 An offshore platform in the Gulf of Mexico. Oil Rigs – If you love the idea of working near the ocean, but not necessarily in the ocean, offshore oil rigs may be another exciting career choice for you. Oil rigs can also give underwater welding a run for its money in the field of interesting working environments. Oil rigs are like self-contained cities, making them a truly unique place to work. Meanwhile, the diverse jobs required of oil rig workers will constantly keep you on your toes. Welding at the LHC tunnel during the first Long Shutdown. 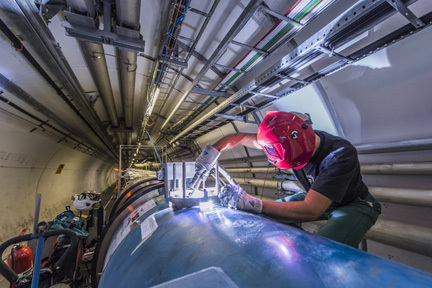 Large Hadron Collider – Although working on the Large Hedron Collider might not offer as exotic a work environment as underwater welding or oil rigs, the giant, state-of-the-art particle accelerator located 570 feet underground is certainly an unusual job. And considering the collider is located in a 17- mile long circular tunnel, a lot of workers are needed for construction and maintenance. 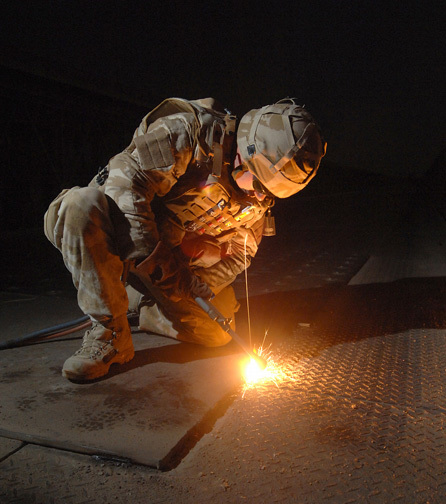 A soldier uses the oxyacetylene welding process on a construction project in Iraq. Military Support Welders – Although the most potentially dangerous of the unusual welding jobs on this list, military support welders are also among the best paid. A military support position can often lead to six digit incomes, and welders are usually stationed in camps at home or abroad. Welders for the military are responsible for maintaining equipment, transportation and gadgets used for combat. This list is only a sample of the exciting careers available in welding. If you want to learn more about how to improve your employability as a welder, we invite you to visit our website: http://awo.aws.org. There you can find blogs, video conferences, online courses and other resources designed to expand your career. We are Slovakian company who are proving welders and pipe fitters with years of experiences and certificates , please if you would be interested can you have a look at our website on http://www.jsgmont.eu . I am having a relevant experience in oil and gas field also in shipyard in different countries now I am seeking job in oil rigs as a fcaw welder. working in oil rigs is my goal and my ambition so please help me to find a job in oil rigs. A close friend of ours was in the underwater welding business and he would always tell us that he had the best work environment around. I would disagree, but after having the opportunity to see what he meant I may have to agree as well. Like you said, it is one of the few that can make such a claim and be telling the truth! It is unclear if I will go the same route, but I can’t deny its draws! Wow! You are right, lots of kids dream about working for NASA, but few think about how a career in welding can get you there. That is awesome. Who knew that welding had so many different diverse career options. I also think that underwater welding is really interesting. Unfortunately I am afraid of diving below about 8 feet. Thanks for sharing the different welding paths. Hello, I’m a Marine Corps veteran. I’ve been welding with many different processes for the last 12 years, but have only recently started a 6 month certification program through Amarillo College in Amarillo Texas. I still have 5 months left to complete the program. My question is how does a person go about getting a job in military support welding. I’m a really good welder, hard worker, and was a Marine in the infantry so I’m no stranger to the hardships of harsh environments. Pls help me our folks. Hi and thank you for your service. We’ve written about a few organizations that may be able to point you in the right direction: Workshops for Warriors: http://awo.aws.org/2014/11/workshops-for-warriors/; Hiring our Heroes and your local Veterans Administration Office: http://awo.aws.org/2014/10/veterans-to-welders-career-building-americas-finest/; and Wounded Warriors: http://awo.aws.org/2014/11/veterans-welding-training-program/. There is also Veterans in Piping: http://www.uavip.org/. I hope this helps. Be well. Tig welder, certified in both carbon and stainless pipes, all dimensions covered, looking for long time projects. Good references.